Archeologists sometimes find ancient artifacts that show considerable sophistication. These might cause us to infer that the people of that time had a better understanding of the underlying science than we had previously given them credit for. This is because advances in technology often go hand in hand with advances in science. Technological advances upon up new frontiers for scientific investigation while new scientific theories lead to new technologies. But that link may not always exist. I do not suffer from jet lag that much but I have friends who suffer terribly. I ascribe my greater tolerance to my belief that a prime cause is tiredness during the long flight and so make it a point to sleep as much as possible on the plane, which I am fortunately able to do. Some people find it very hard to sleep and watch a lot of inflight films which may make the even more tired. I have also experienced that traveling west is easier than traveling east and I put that down to the fact that going west results in the day-night cycle becoming stretched out and so one has longer nights and can more sleep. There has long been a common method used in science and social sciences when deciding whether results are worth publishing. One starts out with what is called the ‘null hypothesis’, a kind of baseline that might represent (say) the current conventional wisdom, and then one sees if the results of the experiment are consistent with it. If it is not consistent, then the results are considered to be more interesting than if they were. This requires the use of statistics and then one has the problem of deciding whether the result is a real effect or a statistical anomaly. For a long time, something called the ‘p-value’ was used to make this decision and a p-value of 0.05 was used as the benchmark for statistical significance. The evolution of whales is one of the most fascinating stories in evolution because it goes in the opposite direction to the conventional story, of a land animal becoming a water-based one. 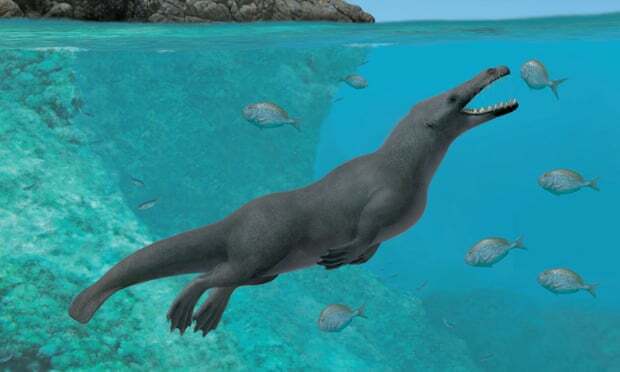 The outlines of this have been pretty well established but now comes a report of the discovery of a new fossil of a large whale with four large legs that showed it to be capable of life on land and sea. A lot of memes have been circulating drawing parallels with the awkward Brexit attempts by the British government, such as this one. I chose this one to highlight because the person seems to have a common misunderstanding that Galileo tried to clear up a long time ago about the nature of relative motion. Since the man was on the train, he had the same velocity as the train when he jumped off and hence was moving in the direction of the tracks when he hit the ground. It was not allowing for that that caused him to fall. If he had jumped more along the direction of the train’s motion and with a running action in that direction, it would have been much less jarring to him and may have managed to stay upright. Not that I am recommending anything that dangerous of course!